Let’s celebrate and make a wish! 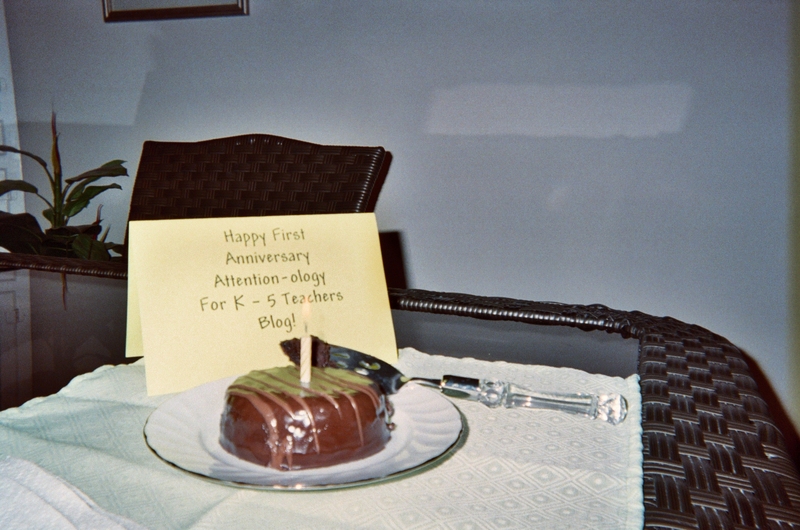 It’s no coincidence that marking the first anniversary of my blog coincides with the tenth anniversary of my work as a writer-in-residence and visiting artist/teacher in schools and organizations where I have been fortunate enough to partner with students, teachers and other participants. If you’re superstitious, as some people are about making wishes known, please skip these next few paragraphs. My wish is this…that my blog continues to build readership and participation in it by readers. This wish has a premise based on a promise – what else can we expect from educators! The premise and promise are that my blog serves all who work with and care for children on a pathway from kindergarten to the edge of middle school by offering practical, effective tools and tricks that can be readily used in all kinds of instructional settings to keep students’ attention. Both the premise and the promise of this blog have their seeds in my most recent decade of teaching. Here’s the deal…as a resident writer/teacher I’m invited into a school for a week at a time to work with however many classes comprise a grade level. In a planning meeting ahead of each week, the teachers with whom I’ll be partnering and I discuss goals, expectations, schedules, etc. The key word for the teachers and funding agencies is the word EXPECTATION. If I don’t deliver on their expectations for student learning, I’ll likely not be invited back the following year. So, I learned early on, that catching and keeping students’ attention from pretty much the first moment I enter any classroom is a MUST. I hope that my imaginary first year anniversary celebratory balloons won’t lose air if I tell you that this blog is the baby of the old reliable driving force – NECESSITY IS THE MOTHER OF INVENTION! Since we’re celebrating, why not think of a way to do just that as an attention-getting trick. Here’s an idea…mark your personal anniversary at your current school with an anniversary cake to share with your class. On the day before you bring the cake to school, announce that tomorrow will mark a special anniversary, a surprise until you cut the cake. Place the appropriate number of candles atop the cake as you display it, light the candles and tell the class that you’re marking your (insert number here) anniversary teaching at (insert your school name here.) Motivate your students by telling them that they stand to become the very best class you’ve ever had! Tell your class that you are all partners in learning. (I promised we’d get back to partners.) Elaborate on the concept of being partners and explore how this concept applies to school work. Partners work together, help each other, muddle through difficulties like mastering science concepts, fractions in math, sentence structures in writing, and partners celebrate successes. Students often partner with other students but teachers can also be student partners. Be a Beach-Going Poetry Partner! The poem below has been partly written by (your name). It needs you to complete it by becoming my “poetry partner.” I’ve written the stanzas you see and I need you to write new stanzas on the blank lines for me, beginning with the words printed for you. I hope that you, my readers, and I partner to develop more creative ways to gain and maintain attention in elementary classrooms. Thank you to all who have read my blog, posted comments, and to those of you who subscribe. ‹ Look, Listen, Love That Word!